Applications to American M.B.A. programs dropped for a fourth straight year, with even elite universities starting to show signs of struggling to lure young professionals out of the strong job market. For the first time in nearly a decade, waning interest in the traditional master of business administration degree hit business schools that draw the most applications, including Harvard and Stanford universities, according to a survey of 360 schools by the Graduate Management Admission Council, a nonprofit that administers the GMAT admissions exam. Those top-tier programs were until recently thought to be immune to the shakeout plaguing less-prestigious programs. Americans are saddled with more college debt than ever, and they have grown increasingly reluctant to leave behind jobs for a year or more to pursue one of the nation’s most expensive degrees, school administrators say—particularly as the economy has improved. In response, schools in recent years have launched cheaper, more flexible or more customized master’s degrees in hot areas such as data science and supply-chain management. In the application year ended this spring, U.S. business schools received 140,860 applications for programs including the traditional two-year M.B.A., down 7% from the previous year, GMAC data shows. Until recently, international students had been a bright spot for U.S. business schools. Now, foreign students face steeper hurdles to getting work visas after graduation, leading fewer to apply to U.S. schools, university administrators say. Overall applications fell more sharply this year than in 2017 as international students submitted 11% fewer applications this year. Applications from U.S. candidates fell 2%. The decline in M.B.A. applicants hadn’t affected top business schools until now, even as smaller programs such as those at the University of Iowa and Wake Forest University closed their flagship two-year programs citing weak demand. A handful of large, top-tier M.B.A. programs such as Harvard Business School and the University of Pennsylvania’s Wharton School last year received a little more than half of all business-school applications, according to recent GMAC data. 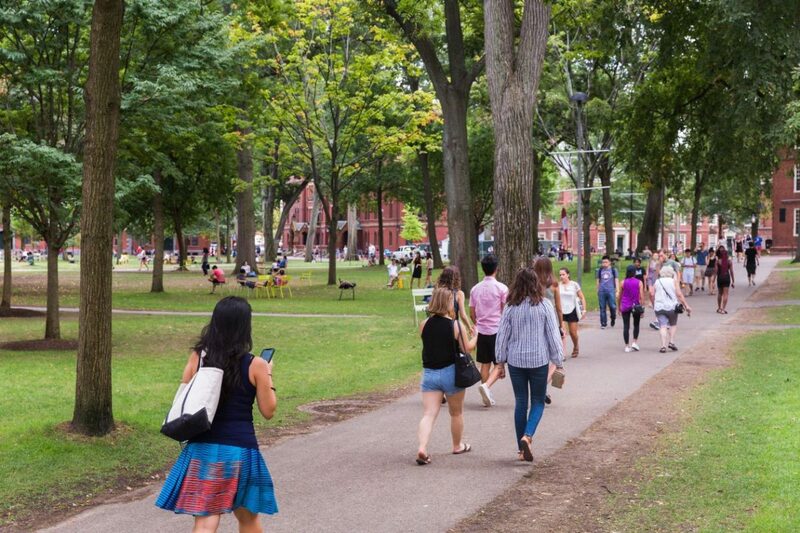 Harvard Business School received 9,886 applications for this fall’s entering class, down 4.5% from last year—the biggest drop since 2005. Applications to Wharton fell 6.7% to 6,245. At Stanford’s Graduate School of Business, they slid 4.6% to 7,797. Such top schools are still receiving many more applications than they can accept, but the declines mark a reversal after years of growth. “People are thinking, ‘Oh my gosh, if the top is struggling to find applicants, what are the rest of us going to do?’” said George Andrews, director of admissions at Rice University’s Jones Graduate School of Business, which saw a 27% drop in full-time M.B.A. applications to 587 this year. Representatives of Harvard and Wharton declined to comment. A Stanford spokeswoman said that the number of applicants will vary from year to year, but that an M.B.A. degree and the Stanford experience remain valuable. The M.B.A. was once considered a prerequisite for climbing the management ladder at many major American corporations. But as students have sought out shorter and more specialized degrees, applications have been scattered across a wider array of schools and types of business degrees, further weakening the M.B.A.’s hold on distinguishing high-performing talent to employers. GMAC’s survey this year included a record 1,087 business-school programs, including 571 M.B.A. programs. In 2015, it included 641 business degrees, 426 of them M.B.A. programs. Sangeet Chowfla, GMAC’s president and chief executive, said it is possible business-school applications are bottoming out as the U.S. economy approaches its peak and could rise again in the next recession. But more competition from high-caliber schools in Asia and Europe, combined with the Trump administration’s heightened scrutiny of work programs for international students, could continue to squeeze American business schools, he said. World-wide, the number of M.B.A. applications was flat from 2017, partly because of an increase in students looking to pursue their degrees in Europe and Asia, according to the GMAC survey. Applications surged 8% to schools in Canada and 9% to schools in East and South Asia. Soojin Kwon, admissions director of the full-time M.B.A. at the University of Michigan’s Ross School of Business, said that despite a 9% decline in applications in 2018 at the school, she expects highly ranked programs will recover from the recent dip. These M.B.A. programs “provide access to jobs with attractive companies and great salaries, with a strong alumni network. That’s what students are buying,” she said. Smaller schools likely won’t be so lucky, she added. “Students are questioning whether the value is worth it, and if they can actually get jobs afterwards,” Ms. Kwon said.